Those charming trinkets of yesterday gave way to paper printed with riddles, silly pictures or, the latest one, baseball trivia: Collect All 34! Blame the “choking hazard” of all those tiny plastic and die cast metal parts. You can also blame the cost of all those tiny plastic and die cast metal parts. Surveying the selection of nastiness that inevitably lurks within the scary depths of a snack machine is something of a depressing process for me. I can eat chips that contain enough MSG to bring on several migraines. I can opt for a candy bar that has enough fat and calories to make up for two meals, plus that will cause a sugar crash like no other. Or… OH! Wait! Life is good. The snacking is good. What’s not to like – popcorn, peanuts and caramel. Oh yeah. C'mon, ya know ya want some! Bag in hand, I return to my desk, happily staving off the massive munchie attack with a snack that, in reality, isn’t that bad for you. It’s been years since I’ve popped open a bag (hmmm…used to be a box!) 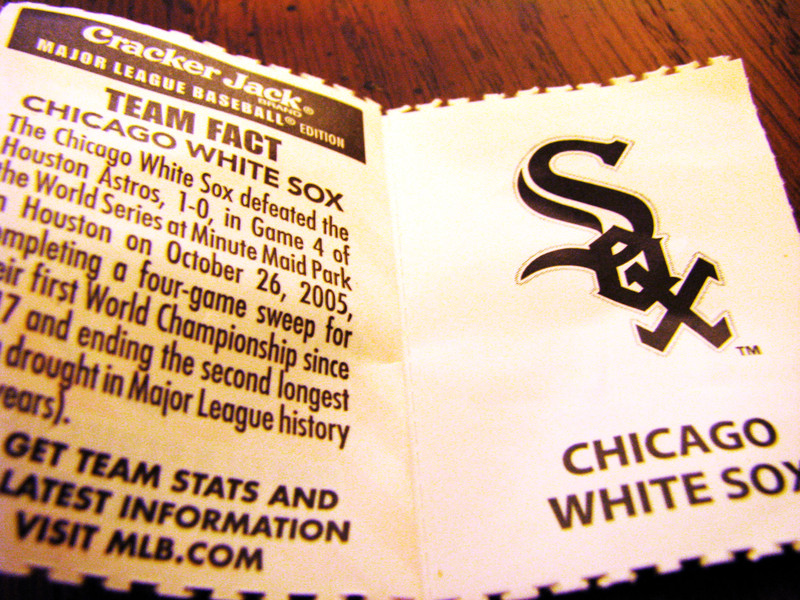 of Cracker Jack, and the nostalgia factor was pretty high. But, oh how things change! They taste just the same. That, thankfully, hasn’t changed. The prize is different, that’s for sure, but that’s life. 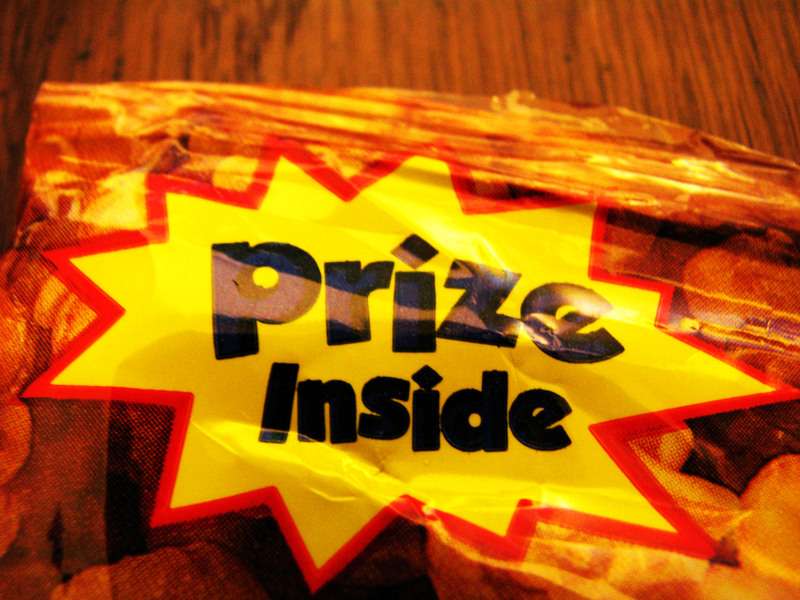 Besides, who eats these things for the prize? Really? Gosh! I’m so glad you said that! Since the “Caramel coated popcorn and peanuts” on the front and the picture of peanuts wasn’t enough of a clue. And if I had any questions, the list of ingredients that puts peanuts as ingredient number four removed any lingering doubts. I realize peanut allergies are serious stuff – but really. This is akin to saying that peanut butter is processed on equipment that also processes peanuts. Huh? OK. I’ll stop. 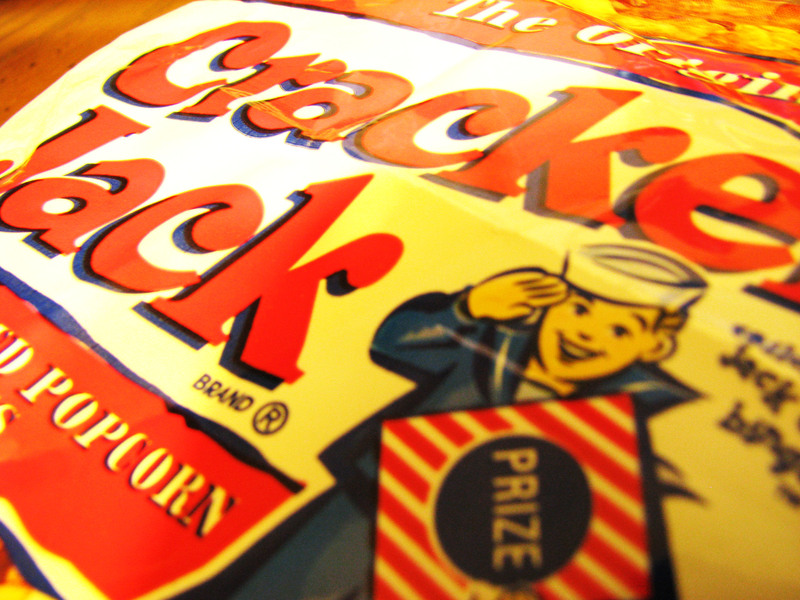 I’m really too busy enjoying my Cracker Jack to think about it right now. Metal giveaways ? I only remember plastic. Hey wait a sec! I’m *not* that old!! !